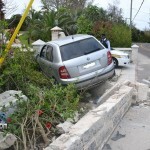 [Updated] At approximately 7:00-7:30am this Easter morning [Apr.24] a car accident occurred on North Shore in the Shelly Bay area, in which the car smashed through the wall, and ended up perched on the remaining area. The Police were on scene this morning. 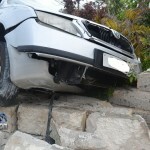 Parts of the car could be seen scattered about the nearby road and the wall also sustained damage. We will update with official information as able, however we unofficially understand the occupant[s] may have walked away from the accident scene. Tell me he was doing 20mph, Hmm. Just what was in that Easter egg? I feel bad for the owner of that house, this has to be the 100th time someone has taken down their wall! why block out the license plate number? given the fact that this person left the scene, it’s pretty obvious it wasn’t a medical condition that caused this accident. we can safely assume this might be yet another drunk driver- they should suffer the shame of having people see their plate number and identify them. as it stands, we already have such a relaxed attitude towards drunk driving. 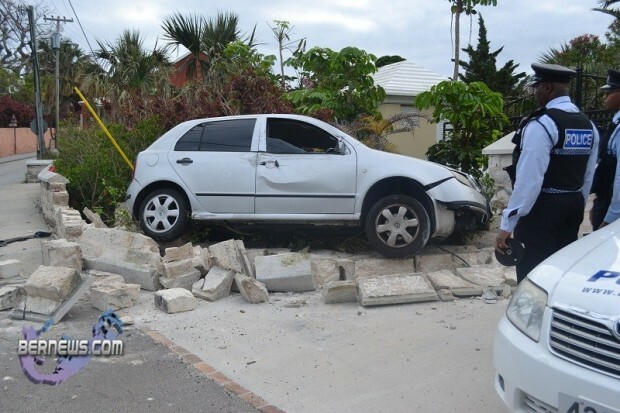 ‘Another drunk driver?’ …. Or maybe another driver under the unfluence of drugs ? One can rest assured that there’s probably more people driving under the influence of herb , crack or whatever on the roads at any given time than booze nowadays but we seem to forget that fact . where are you getting your information from? you have ZERO evidence to support this ‘fact’ you speak of. given the actual fact that thousands of people consume alcohol openly every day of the week, the FACT is that there are clearly more people on the roads under the influence of ALCOHOL than other drugs. Did either one of think that maybe this person just finished work and fell asleep at the wheel?? So quick to judge!! So why did they leave the scene???? I agree with noddy ! There’s a ton of people here doing all sorts of illicit drugs at all hours of the day and night . Just because you know of ‘thousands’ of people who ‘openly drink’ , does that mean they’re all getting behind the wheel ? What about our little culture of ‘ I can’t go to work without my first joint to start the day ‘ ? I’ve been behind many a vehicle with only one occupant and eau de herb pouring out the vehicle. 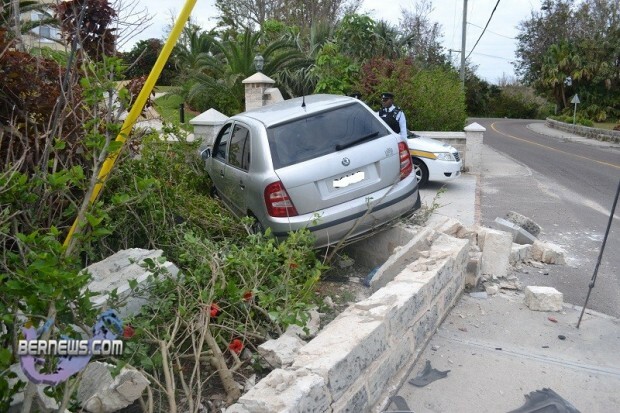 Considering that the largest number of our ‘drunk drivers’ are caught doing so between certain night time hours , I too believe that throughout the 24 hour span of a day there’s more people on the roads In Bermuda under the influence of other mind altering substances. It only takes a little common sense and getting out of denial to figure it out. 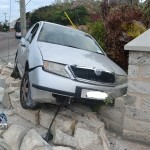 Well, it wasn’t so long ago this wall was smashed by another “Sunday Driver”. I say to the dear folks who own this property and wall, may I boldly suggest you replace it now with a NERF wall? LOL….despite the severity of this incident, I had to laugh at this comment! This is ridiculous! Needless to say I am glad no one was injured, that includes driver and other motorists as there have been a few lives lost on this same corner! People PLEASE stop driving under the influence and past the speed limit! Here we go again. So quick to judge. 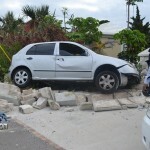 Drunk driver, influence of drugs. 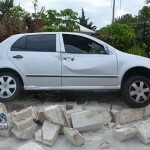 Driver just was going west to deliver eggs after Sunrise Service..(sun rises in East for all you uneducated Tech People)…..
Police car came round dee corner, cut hyme off slammed into the wall. Simple. My sauce says that all three Police vehicles were filled with fishcakes and Hut Krozz buns……go figure…….